Dreadlocks and downtuned guitars: That says "Silent Hill," right? Konami has hired heavy metal band Korn, one of the progenitors of the nu-metal genre, to perform the theme song for the latest edition of the Silent Hill series, Silent Hill: Downpour. Korn's previous work in videogames is limited, although the band did write a song based on the PS3 exclusive Haze in 2008. The earlier games in the Silent Hill series have all had music composed by Akira Yamaoka, but he elected not to return for Downpour. Instead, Konami hired Dexter composer Daniel Licht to provide music for the game. It seemed reasonable to assume that Licht was composing all of the music but clearly that isn't the case, and Konami has decided to go add a little "star power" with the multiplatinum-selling band. Korn seems a strange choice to work on a Silent Hill game. Regardless of whether you like their music or not, they're not on obvious fit for a tense, psychological survival horror game. That's not to say that Korn couldn't produce something appropriate - lead singer Jonathan Davis composed all of the original songs for the Queen of the Damned, which had a much more creepy tone to them - but even so, that's hardly representative of Korn's music. Of course, an odd choice of musician for the theme song doesn't mean that the game will be bad. Unfortunately, as you can read in our E3 preview of Downpour, it doesn't seem to be the only thing that isn't quite right about the game. 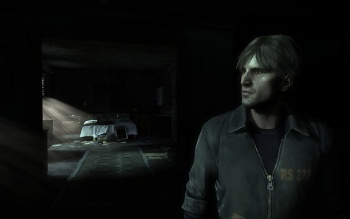 Silent Hill: Downpour comes out for Xbox 360 and PS3 later this year.